dunk all the ingredients into the pressure cooker with about 3 cups of water ( or more if you like it thinner), except butter and garlic , and cook till 2 whistles.....cool and mix well. wow the soup is jam packed with healthy nutrients, thanks for sharing this! Lovely and healthy soup. 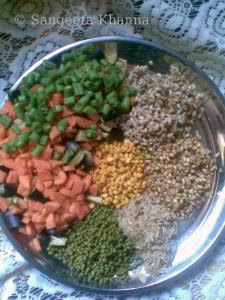 Nice idea to add multiple whole grains. yummy soup. quite healthy. Lovely blog. Do check mine..! Hi Sangeeta, I prepare the exact same soup and call it pressure cooker soup. I add some whole wheat pasta too and vegetable stock insted of the water. Thats everything a body needs in a bowl..hats off dear..!! This soup sounds wonderful! All those healthy grains. And yes, weight loss has been pretty constant in my life. Right now I need to lose a few kilos as well. You have to love a big bowl of hearty soup. This looks and probably smells delicious. hey sakshi ..you can have this for your health http://banaraskakhana.blogspot.com/2009/06/banana-malpua-with-malai.html and now you must be happy dear. 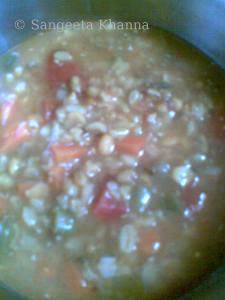 @ madhuram....your soup with pasta also must be good....i like pasta soups too.....this one serves a purpose for me. 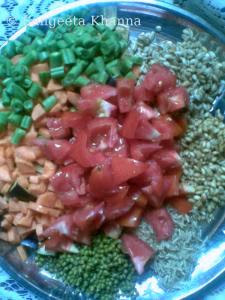 @ sharmila even i tried whole wheat grains for the first time...mostly i used daliya earlier. @ lori...yes dear wt. loss is all about a commitment with yourself....and sometimes it comes naturally ..when you are ready of course. would love to try this!!!! 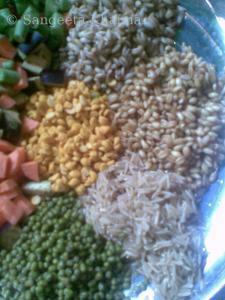 I tried your idea of multi-grain poha and loved it!!! how the heck did i miss this post!? Will let you know when I try this. I saw daliya @ the desi store didn't buy it but next time will. Handavo and the soup are on my list now. 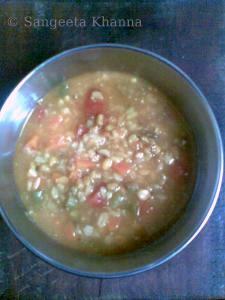 and that banana malpua which you recommended to sakshi..
Soup from scratch sounds healthy. Nice write up too dear. First time to your blog. You have a nice collection of healthy and interesting recipes. The soup sounds wonderfully delicious and healthy!